Warm socks and thinner for small children, associated spokes are more traditional, and many skilled workers even believe this method is easier and faster. But still want to please lovers of crochet, that the process of knitting socks, with this tool is also not very difficult, and for some it may even seem more fun and easy. In addition, the products obtained by a hook at least comfortable and beautiful, it is only necessary to know how to make them. Let us consider the process of creating this product. 1.Knit the top of the sock – the cuff. For gum hook better to take the size of the floor-less, than for all other parts of the sock. The starting point is the entire chain of work, The compactness in the ring and consisting of 60 petelek. 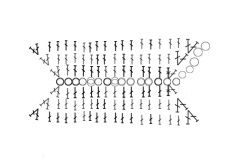 Starting with this chain you need to knit 25 series follows: 2 column without nakida for both loops walls. 2 column, without sc for the back wall tabs. After that connect with a hook edge cuff. 2. Once the gum is ready, you can begin to knit a sock heel hook with a diameter twice as thick yarn. Divide in half sleeve, We note markers and edge, since the mid, provyazyvaem nakida bars without thread on the darker tone, than to take the cuff. Start at the heel provyazyvaem many rows, to the resulting triangle length was two times less than its width. Then it is necessary to round the heel. For this painting, connected to it is divided into three parts. The first part of provyazyvaem polustolbikami, but when you come to the middle provyazyvaem its columns with sc. Then pull out the next two loops of two loops, so that the hook had three loops, to be knit together. The web was then turn around and again provyazyvaem middle part of the heel, starting from the second loop and, reaching the end, again pulling the two loops of the side parts and provyazyvaem them together with a loop, which is already on the hook. In this way, heel fit, until all its tabs will be involved. 3.Knit the rest of the sock. Again taking the thread base color and tied around the resulting hole sock, in the following way: two bars, without sc for both loops wall, two bars with the rear wall of the sc, at the same time in a row at the sides do not forget to turn down the two loops. In this way, provyazyvaem canvas, until it is level, then at the time of stop subtraction, until, until we reach the beginning mysochkah. 4. vyvyazyvayut toe. Change the thread on the darker and knit rows of columns, without sc, subtracting one bar in each row. Knitting continues until, until there 8 petelek, which neatly sew, so that in the sock turned rounded edge. Then the second knit sock. 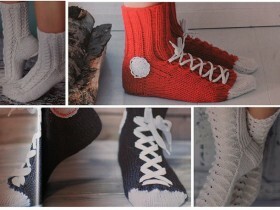 If desired, socks can decorate shnurochki, sell it to the front, as shown in the photo. These socks are knitted for babies with the size of the foot 15 cm. 1 row: 1 air loop for lifting, two columns with a sc loop in the second series, then in each loop until the penultimate series gets involved on 1 columns with sc, in the last two columns we provyazyvaem loop with sc and do the connecting loop. The next two rows in the same way provyazyvayutsya. 4 a number of knit scheme: 4 lifting loop, 1 column with sc in the first of a number of loop, *two skip loop, 1 column with sc in next st, 2 air hinges, column with sc in the same loop *, to the end of the row of knitting repeat, starting with a pound sign *. 5-11 row 4 lifting loop, 1 column with sc in the column with the loop of the previous row sc,*1 column with sc in arch, 2 air hinges, 1 column with sc in same arch *. Rapport repeat to end of row. In the next step mysochek folded in half and do 15 stitches and fasten them to the other side webs. After which the knitting is done in a circle, since the chain loops and eyelets sock finishing bulkhead in the same way as the 5 row. In this way, provyazyvaem more 9 series. The next series of columns is done with sc. 1 row. Bars without sc. 2 row. 1 lifting loop, two skip loop, then to the end of the series: 5 columns with sc in next st, 5 loops skip, 5 columns with sc in next st. After that cut the working yarn and fasten. In the next phase begin to knit a sock heel hook. 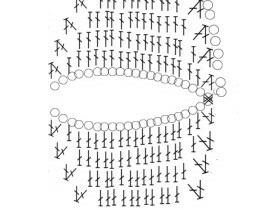 Anchoring the thread from the side cut-out heel and knit circle: two lifting loops and two loops together with the column sc, two loops together with the column at the beginning of a series of sc, then the columns with sc in each sc around, at the end of a series of twice provyazyvaem on two columns together. In this way, knit, until there are several loops, which connect to the underside of a loop, after which the first ready nosochek. By the same principle, and make a second. 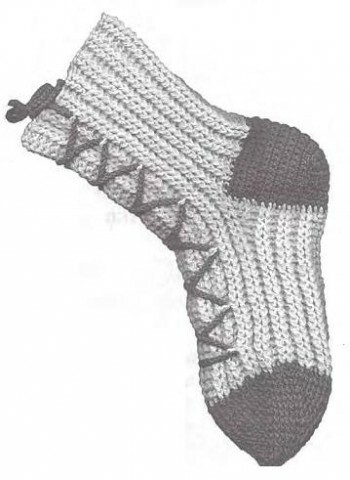 socks, connected in this manner is soft and pretty, and it is possible to associate in the same manner if desired, men's socks or pair of female. To do this, we just have to make the necessary measurements and choose the appropriate thread color.